Hardwood flooring is a wonderful addition to any home. 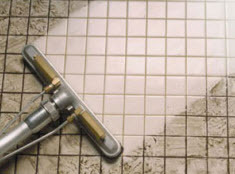 Leading Carpet Cleaning offers expert custom hardwood floor installation services. We offer a wide range of hardwoods and patterns to match any home interior decor. 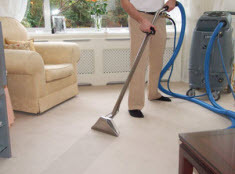 Leading Carpet Cleaning are committed to installing the best wood floors to suit your style, needs and budget. We are precise and meticulous regarding every detail; from properly leveling your subfloor all the way to the durable seal that will assist your new hardwood flooring to last for years to come. – Solid hardwood in which each piece or plank is made from a solid piece of wood. Solid hardwood floors come is a broad range of varying thicknesses and widths as well as a wide range of different types of wood. – Engineered wood floors in which each piece or plank is a composite made of ten thin layers of wood bonded together in a cross ply formation. This process gives it strength and durability. Engineered wood floors also come in different thicknesses, widths and styles. Both solid and engineered hardwood floors look beautiful from the very first day they are installed. The appearance, patina and appeal improves even more with age when you schedule proper maintenance and regular scheduled cleanings with Leading Carpet Cleaning. Under our expert care, a properly installed hardwood floor will gleam like new for many years to come. And if ever you need a minor spot repair or touch up, or a complete hardwood floors refinishing, our technicians will be pleased to provide whatever hardwood flooring services you need. Contact us today to get started! Leading Carpet Cleaning is a company that always combines professional quality wood floor refinishing with affordable prices. You can count on our professional team to provide you with reliable, quality services every time. We know what it takes to get the job done right! When you have your hardwood flooring refinished with Leading Carpet Cleaning, we can keep its beauty and strength for a long time as we properly care for it. We have the training, knowledge and experience necessary to provide you with top-notch hardwood floor refinishing. The sanding and buffing process creates a significant amount of dust. We ensure that your furniture is properly covered and all areas are sealed before beginning the hardwood floor refinishing process. Wood sanding is the process of using sanding machines to remove the existing coating layers and stain down to the bare wood. Floor sanding is necessary when changing the color of the hardwood or where the hardwood has signs of wear, scratches, gauges and other types of damage that cannot be removed by simply buffing the floor. The first step in sanding the floor is determining if the floor is thick enough to withstand a complete refinishing. Our skilled estimator will check for signs of previous sanding jobs as well as exposed nails and openings that can reveal the thickness of the floor. The condition of the wood will help to determine the number of times the floor will be sanded to achieve the desired quality. The actual sanding process will start with a rough sanding paper to remove imperfections followed by one or two finer grits to smooth the surface. After we have sanded your floor, we then buff it with a buffing machine to remove sanding marks and unseen scratches. In some cases, we use wood filler to cover spaces between the planks. Wood filler may be applied before and during the hardwood floor refinishing process but only on floors that are installed on hard surfaces. If your floor doesn’t have a solid subfloor, the movement of the floor would crack the wood filler, exposing uneven spaces between the boards. We also buff between coats to smooth the small pieces and achieve maximum smoothness. Staining is the most important step of a complete floor refinishing. We begin by washing the exposed wood with water to remove most of the wood sanding imperfections and achieve an even stain application. We may apply the stain by hand, pad or with a floor buffer. 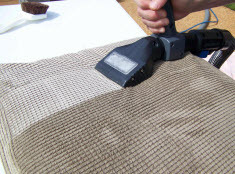 Whatever methods we use, Leading Carpet Cleaning ensures that the stain is applied evenly and excess stain is wiped off. After the stain is dry the floor has to be covered with the desired finish. We offer water base, oil base or acid cured finish options. Water base finishes have the advantage of a low odor finish and is recommended in households with children and expecting mothers to help prevent any health issues. Oil base polyurethane and acid cured finishes are recommended in high traffic areas such as kitchen areas where spills could stain and damage the water base finish.